Designed to compliment our highly praised Lesson Presenter, the Part 3 Lesson Plans contain 14 pages of comprehensive guidance notes for the 10 Pre-set Test (PST) subjects. 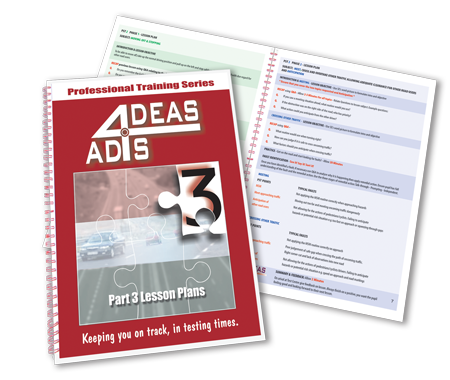 Together with the ADI Lesson Presenter, this makes the ideal training aid to help you prepare for the DSA Part 3 Exam. "People are very quick to complain about things, so, I just thought I would write to compliment you. I have been purchasing material from you for a while, both when I was training for Part 3, and since I qualified. What can I say? I've never seen such a quick, efficient, friendly service before. The quality of all the products has been excellent. If only other companies learnt from you, life would be so much easier. Thanks and keep the superb work."